Officially A Yuppie: EXCLUSIVE! Austra INTV! After being named one of our "15 Artists to Watch in 2012," Canada's Austra are certainly living up to the title. The Canadian three-piece electronic band have been making a name for themselves for a handful of years and last year saw them release their debut LP, Feel it Break on Domino to rave reviews. In fact, Austra were shortlisted as one of the finalists for their country's Polaris Prize but lost to Arcade Fire. The band is a wild, sexually charged and fierce talent that creates a sound to be admired. 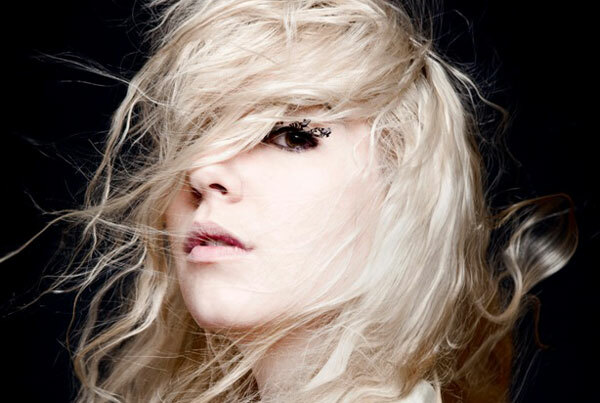 Take a look at our interview with Austra front woman, Katie Stelmanis. Take a look. Hailing from Canada, we have seen many electronic inspired acts break out from there over the years. Is electronic music very popular there? Its not hugely popular. Canada has a really small population and its difficult to foster a huge number of music genres. At the moment there just isn't a foundation for electronic musicians to make their music heard in Canada, so most of them have to seek recognition in other countries that are more set up to support it. You are a classically trained artist, do you take what you know about classical music and bringit to electronica? Are there similarities in composing the two different genres? I think electronic music and classical are quite similar. They both rely on the quality of the arrangements, and have layers and layers of harmonies, tracks, and landscapes within each song. I think my background in classical music led me to make electronic, because I could create complex arrangements for many instruments on my computer. There has been so much buzz about the band in recent months, how to do respond to it? My band and I are very realistic and try not to pay attention to buzz. We work hard and will continue to work hard and take the project as far as we can. You seem to be the center piece of the band, is this your band with two backing members or a solo project under the banner Austra? Its a collaborative project between 3 musicians, though that is always evolving. Currently I am touring as a 6-piece who all input their ideas into the project. Where does the name Austra originate? Its my middle name, and its a traditional Latvian name. Sexuality plays a strong role in Austra, is it liberating to express yourself over music? I think that music and dancing is a very sensual thing and people should feel like they want to express that when they see music or listen to it. Indie rock tends to be quite the opposite and we like bringing a strong sexual vibe to the stage. You and Maya are gay and with sexuality playing a strong role in the music, is this the most gratifying outlet on how you can express yourself? I suppose. I never think of my music as gay music, or as music with a political message. I am political as a person though and enjoying speaking up about the topic. Do you find fans coming up to you and thanking you for being so proud of who you are? Ya we do actually, I've had a lot of people thanking me for being at out musician. There was an interesting paradox with how your video for “Beat and the Pulse” was censored from Youtube, while other videos – far more graphic and violent, were allowed. Do you feel the double standard in what is right and wrong in entertainment more frequently now? I think its a clear depiction of where North America's values lie. There is a lot of hate, violent stuff on youtube, but clearly women's sexuality is more offensive to America's population. How would you describe your music to someone that has never heard you before? What can we expect from Austra down the line? Lots of touring and lots of music.